$15 per person, includes lunch. Enter '0' if buying a 'Family Pass' instead. $40 per family, includes lunches. Enter '0' if buying individual passes or '1' for entire family. The deadline to purchase Advanced Unlimited-Play Passes via CHECK has passed. Please choose the "Online Today" payment method above and pay with your credit card or PayPal account. You may also purchase tickets at the door the day of the carnival. Clicking the "Submit" button below will take you to PayPal website to complete your reservation by making a payment using PayPal or a credit card. You do not need a PayPal account to use this service. At the PayPal site, use your PayPal account by simply logging in to your PayPal account. To use your credit card, just click "Pay with a debit or credit card" and it will allow you to enter your credit card informaiton. Once your payment is complete, you will get TWO confirmation emails: the first from PayPal letting you know that you made a payment, and the second from Temple Sinai thanking your for your ticket purchase. Payment due in the Temple Office by 3/15/2019. Clicking the "Submit" button below will send your reservation to our Temple office. PLEASE NOTE: You have chosen to pay Offline via Cash or Check. In order for us to honor this ticket reservation, you must deliver your payment to the Temple office ASAP. ALL payments are due in the office by NOON on Friday, March 15, 2019. 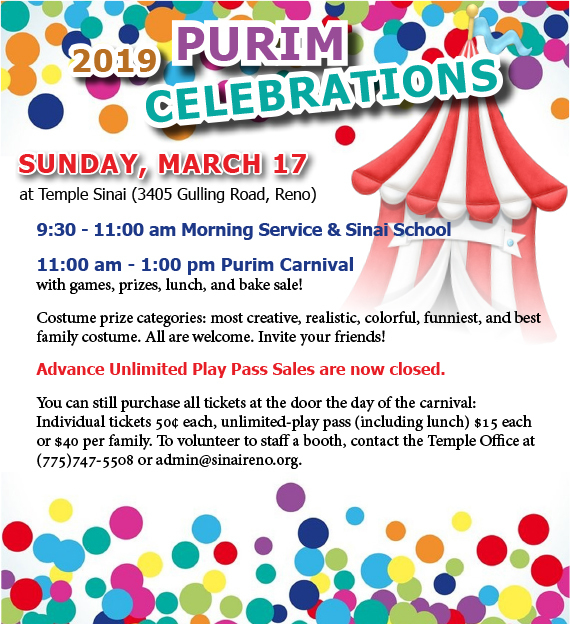 Please make your check out to "Temple Sinai" and mail it to Temple Sinai, 3405 Gulling Road, Reno, NV 89503, or, drop it off at the Temple office. Be sure to put "Purim Carnival" on the memo line of the check so we can match your payment to this ticket reservation.